Portage and Main was closed to foot traffic almost 40 years ago, and it was one of the most destructive things Winnipeg has done to its downtown. It's time to lift the gates and let the city breathe. Portage and Main should of course be reopened to pedestrians. It was closed to foot traffic almost 40 years ago, and it was one of the most destructive things Winnipeg has done to its downtown. It was a completely wrongheaded way to "save" downtown Winnipeg from decades of neglect and from forces beyond the city's control. Traffic was increasing, suburbanization was in full force. The city capitulated with no vision whatsoever and basically decided the car was going to dominate city planning. Allowing and encouraging this downtown was especially egregious. How long does it take to cross Portage and Main underground? Central and downtown Winnipeg had (and still has) many favourable characteristics, including many untapped and unique ones. These characteristics include a large mature housing stock nearby, including apartments; a large mature urban forest (a lot of boulevard trees); an easily navigable grid street system; a well-used and efficient transit system (especially compared to other North American cities); a world-class stock of historic buildings; an amazing arts scene (professional as well as indie theatre and music); professional sports teams; a unique climate (that ranges from lows of -30 C to highs of plus 30 in a matter of six months); and a unique setting with rivers and lakes and wilderness a short drive away. 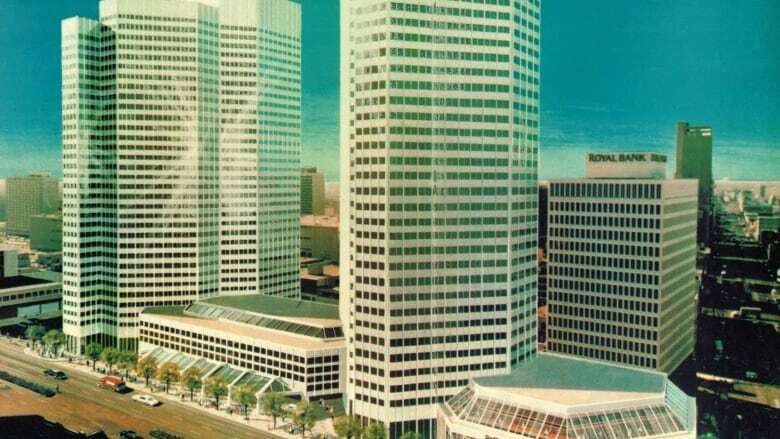 In the 1970s, city council was desperate to attract development to downtown Winnipeg; they wanted another tall building at Portage Avenue and Main Street. Trizec Corp. from Montreal showed interest. Some city councillors and the mayor went on a junket to Montreal partly to view Trizec's Place Ville Marie development in downtown Montreal. They wanted something like that for Winnipeg; they really liked the subway that travelled beneath the office tower. The corner of Portage and Main has been closed to pedestrians for 37 years. 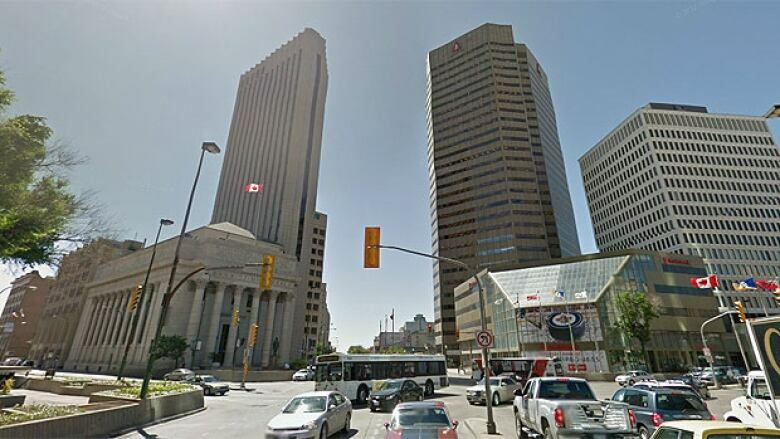 (Google Street View)The councillors and the mayor came back and convinced city council to buy all the land on the block on the southwest corner of Portage and Main, except for the Royal Bank building (220 Portage Ave.) and the land right on the corner owned by Scotiabank. The city expropriated all the land and spent $20 million to build a parking garage and underground mall, and Trizec promised to build a million-square-foot development containing two 30-storey office buildings, a first-class hotel, a department store and apartments. In the end, Trizec built only what they were legally required to build — a 300,000-square-foot office tower and nothing else. Mayor Stephen Juba, most members of city council, most planners and developers wanted a "modern city," and that meant new highrise buildings and a separation of vehicular traffic from pedestrians. Official plans for Winnipeg in the 1960s and 1970s included building parking garages (publicly funded) and freeways everywhere to get to the parking garages. But the city in the 1970s was in a slow growth cycle and private developers were reluctant to build in Winnipeg. Most development was happening in Toronto and Calgary. Since the 1960s, Winnipeg City Hall has tried to use megaprojects to kick-start the economy and "improve" the city. Urban renewal schemes were hatched throughout the central city and downtown, such as Lord Selkirk Park in the North End and the Centennial Centre on Main Street. The Centennial Centre was only a fraction of what was originally planned for the east side of Main Street. All but four or five buildings east of Main were to be knocked down to make room for modern structures and freeways along the Red River and in the Forks area. There were also massive plans for the Central Park area and for south of Portage. The convention centre and Lakeview Square are products of these plans. Always central to these plans were parking garages. Must have parking garages; must separate cars from people. Public transit was largely ignored. Winnipeg Square and the underground at Portage and Main fit perfectly into this dream. However, it became a nightmare; costs rose, and Trizec, with more development experience than members of city council, got many concessions, including making it illegal for pedestrians to cross the street. Trizec was worried people would avoid their underground mall if they had a choice. Trizec and the city achieved the goal of encouraging people to walk through the mall by making Main Street and Fort Street so ugly. The city allowed, encouraged and helped a developer build (actually not build) one of the ugliest structures anywhere. 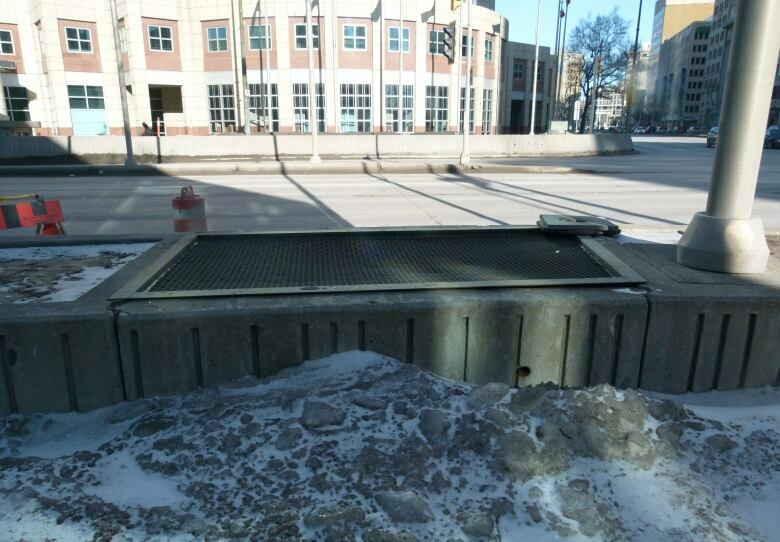 Concrete barriers at Portage Avenue and Main Street were designed with gates that can be opened using a crane. (David Loftson)There was, however, one time in the 1980s when it was legal to cross the intersection. The concrete gates that were built into the barricades were opened. Yes, there are gates in the barricades, two at three corners and one at the Richardson corner — concrete gates with small holes where a crane can hook in and lift them to allow passage for pedestrians. It would therefore, on a trial basis, be easy and economical to open the intersection. Lift the gates, have cadets supervise, let the city breathe. And I predict that the many pedestrians who cross the intersection will do so safely, and any drivers frustrated with the "horror" of seeing lots of people on the streets of Winnipeg's downtown will easily find alternative routes. David Loftson is a local historian and recovering bike messenger. His column Flat Not Boring can be heard regularly on CBC Radio One's Weekend Morning Show with Terry MacLeod.